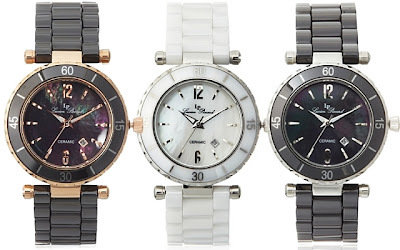 This Lucien Piccard La Tournette Mother-Of-Pearl Dial Ceramic Watches are currently selling for just $159.00 each on MyHabit.com! You will be saving 80% off the listed price of $795.00 with this jewelry deal. More about these Lucien Piccard watches . . . Most My Habit purchases come with Free Shipping and Free Returns, with the exception of heavy or oversized items. The reduced-price name brand and designer items on MyHabit.com are only available in limited quantities, so do not wait too long to take advantage of this discounted price. Stop by daily to shop for designer fashion deals, deals for women, deals for men, deals for children, and home furnishings deals. For shopping on-the-go, grab the MyHabit iPhone app!